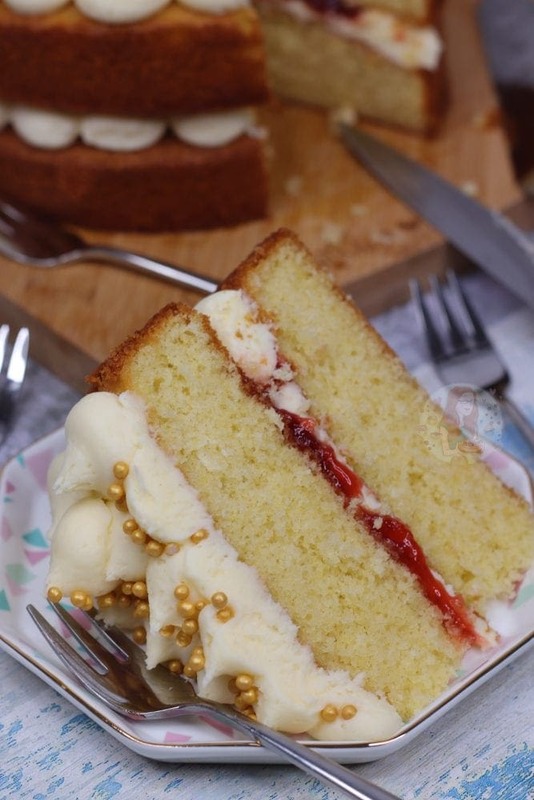 A Delicious Two Layer Vanilla Cake with Vanilla Buttercream and Strawberry Jam! Back in 2018, I thought I would start a new series on my blog – Back to Basics. As much as I hope that all my recipes are simple and doable by anyone of any baking ability, I know that some are not! Or, some people do just want to learn the basics – and I want to help with that! 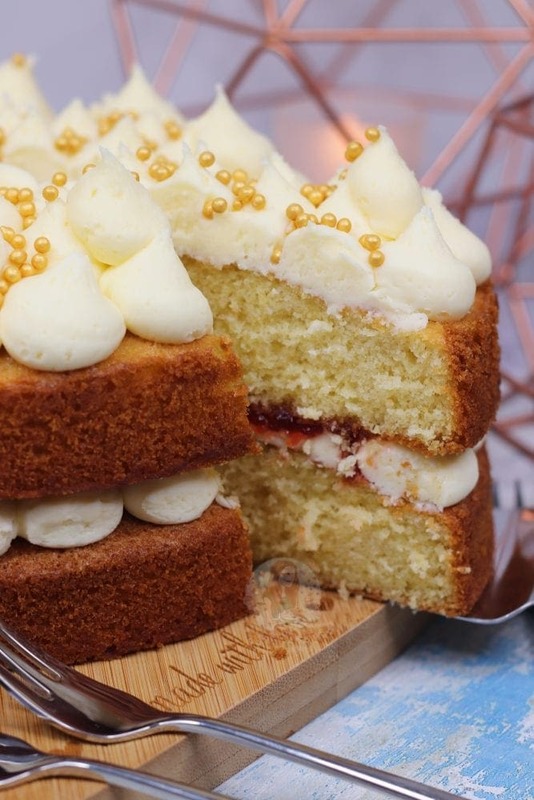 I thought that I would go for an absolute classic for my fourth instalment, a Vanilla Cake. This beauty is a two layer Vanilla Sponge cake, with Vanilla Buttercream frosting, and one of my favourite Jam flavours… Strawberry! Okay, so Back to Basics has potentially gone a little bit too basic now, with a Vanilla Cake.. but I’ve had endless requests. I do have a Victoria Sponge recipe on my blog already, but this a two layer beauty and potentially explained in a much better way. I hope. My first part of the Back to Basics series was my Triple Chocolate Brownies, followed by my No-Bake Vanilla Cheesecake, and then thirdly the Chocolate Cake. I figured doing a Vanilla recipe would fit with the system and alternating between the two flavours! But anyway… this is basically the most simple yet most scientific of cakes. It only really takes four ingredients to make something DELICIOUS, but you have to get it right. It doesn’t really matter whether you use a two egg recipe, three egg, four egg etc… as long as the ratios are equal. 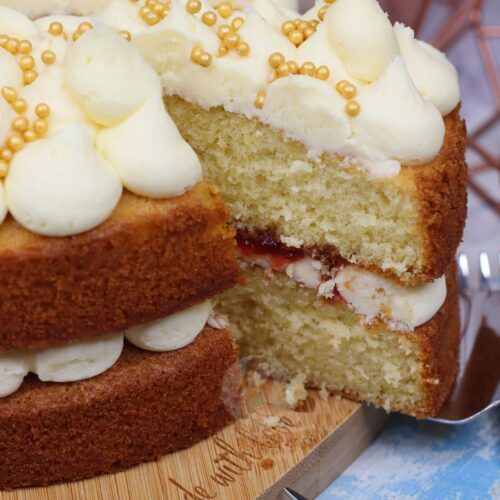 There are obviously other factors that are involved with getting the perfect cake – but really the ratio, how you mix it, and the oven being the correct temperature is so important! I use a Fan oven, so I bake my cake at 160 degrees! As my oven is new, it helps so much, but with other ovens I have used an Oven Thermometer to make sure my oven is correct before baking – as ovens can be drastically out! 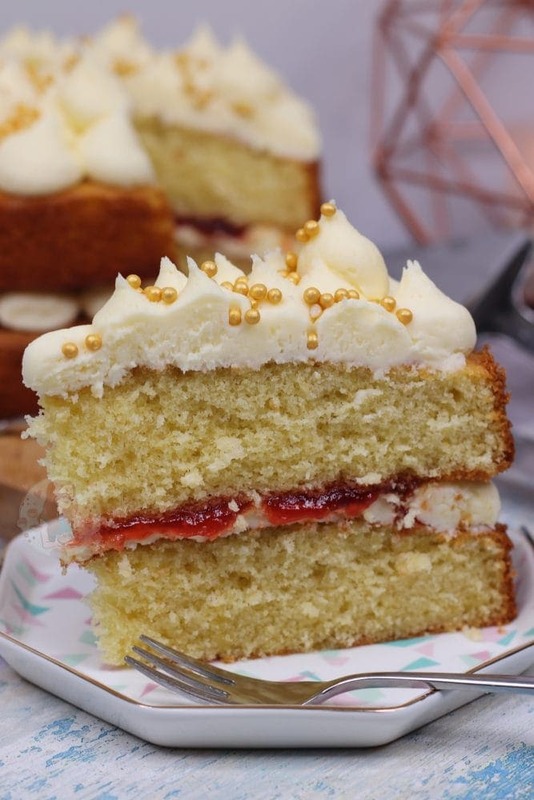 I’ve mentioned this before, but I’ve heard (this could be incorrect), that the ovens on The Great British Bake off are tested each day before the contestants start by baking a Victoria sponge – as it’s the most classic and scientifically easy bake! If the bake doesn’t bake correctly, but you know its weighed and mixed correctly, then usually it means it’s the oven. If you know your oven is at the right temperature – just make sure you mix it correctly. I personally switch between the all in one method, and the beating sugar and butter first method – but in general, I find the beating the sugar and butter together method is better for the most. 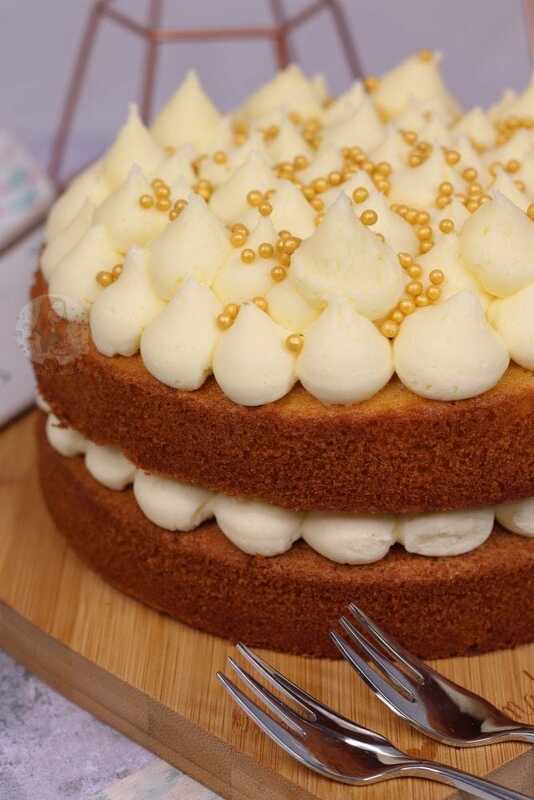 If the butter is too cold for the cake, it can make the cake mixture a little lumpy. I usually use room temperature unsalted butter (the kind you get in foil), or Stork for cake sponges. Either work absolutely fantastically! However, for the Buttercream, you must NOT use Stork. 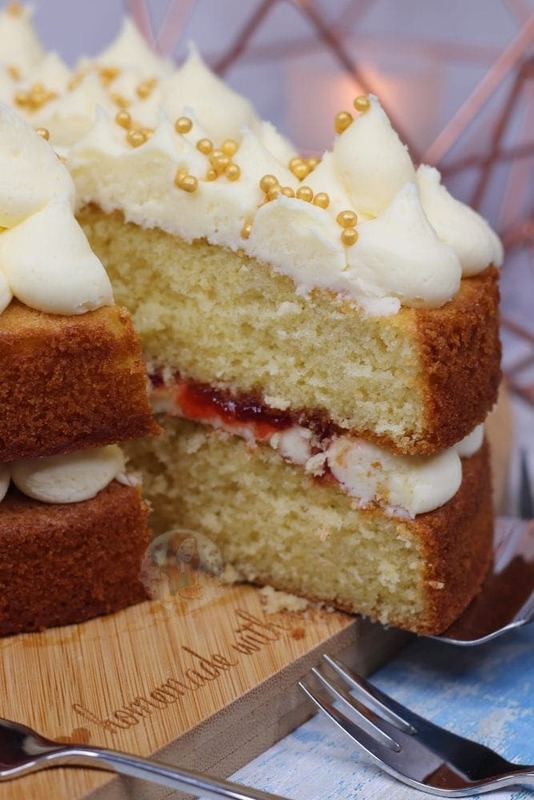 Only use Unsalted Butter for the Buttercream – otherwise it can split or taste horrible! I personally use my Kitchenaid Mixer with the scraper paddle attachment for a majority of my baking – and all my cake mixes and buttercreams. I don’t use a whisk, as that creates too much air, and can be quite faffy – but if you have just a handheld mixer, then the whisk attachments for those are fine. 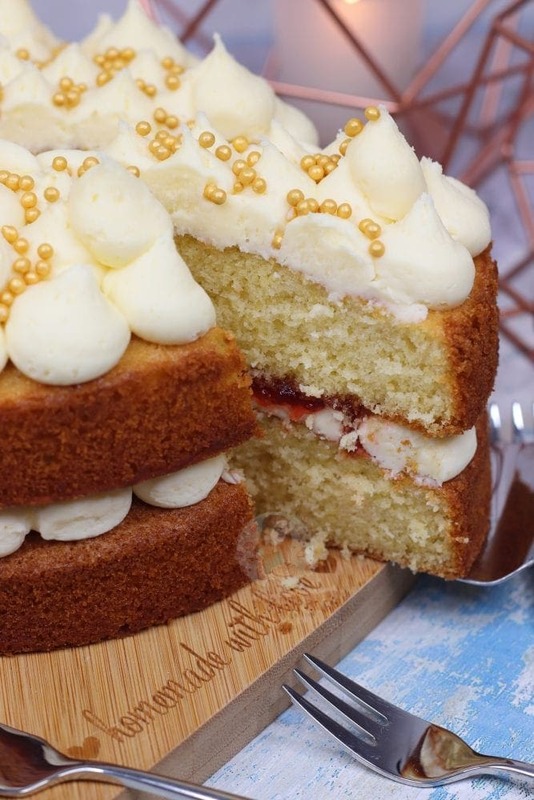 You can easily make a cake mix and such with just your hand, a bowl and a spatula, but for buttercream it does take a bit more welly to get it just perfect! 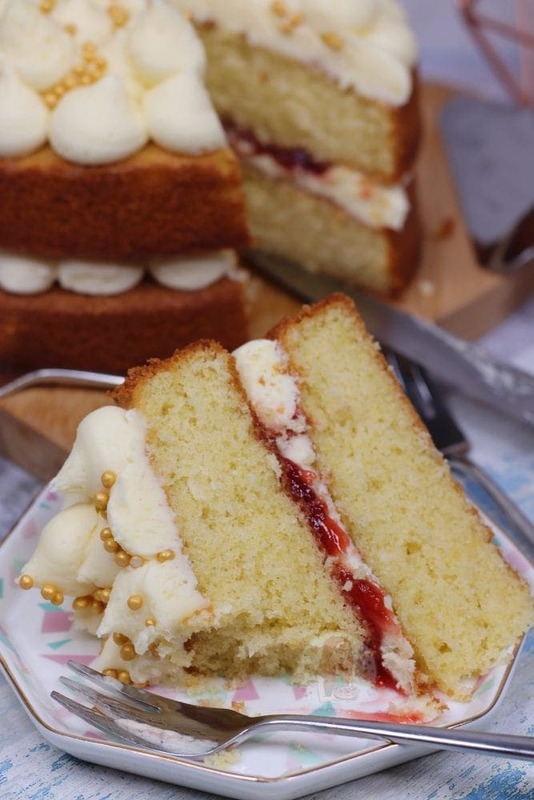 You could go the whole hog and make your own Homemade Jam if you want, but I just thought I would stick with this recipe being about the actual cake! 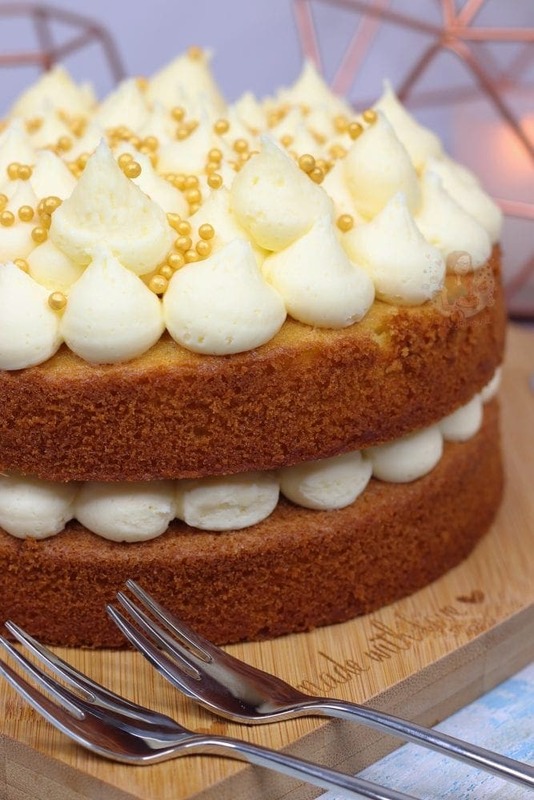 Vanilla Cake - Back To Basics! Preheat your oven to 180C/160C Fan and line two 8"/20cm tins with parchment paper, and leave to the side. Beat together your Butter and Sugar for 3-4 minutes until light and fluffy! Add in your Self Raising Flour, Eggs and Vanilla and beat again for a a couple of minutes till smooth. Once in the tins, bake in the oven for 30-35 minutes, or until baked through. I check my cake is baked by using a skewer, and listening carefully to see if it bubbles! Once baked, leave to cool in the tin for 10 minutes, and then transfer to a wire rack to finish cooling. To make the Buttercream, make sure your butter is at room temperature. Beat the Butter on its own for 3-4 minutes, I use the paddle attachment. Once the Butter is nice and supple, add the icing Sugar in 1/2 at a time, and beat fully before adding any more in. Add in the Vanilla, and beat again for 3-4 minutes until it's all come together. Carefully pipe or spread half of your Buttercream onto the first cake, and then top with some Jam. Add the second sponge on, and then spread the rest of the Buttercream on top. Decorate with your favourite sprinkles, and enjoy! This cake will last for 3 days at room temperature, in a cake box. You don't have to use the vanilla, but obviously that is the theme of the cake! You should always use Vanilla Beans/Pasta/Extract over Essence as its much more natural! The Jam is optional - or you can swap to whatever flavour you prefer! Older Next post: Slutty Brownies! Hiya do u ever happen to freeze any of your sponges prior to decorating? I don’t personally as I never have the need, but I know a lot of my readers do! Best practice is to double wrap in clingfilm and then in foil to prevent any freezer burn! Hi I want to make 3 layers to this cake using 8” cake tins how much more ingredients do I need ?? Love all your recipes Jane – especially the cheesecakes! Thank you.